Okay, I'll be the first to admit that some days it doesn't take a whole lot to humor me. 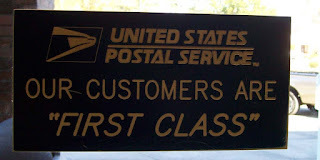 For example, yesterday, I was leaving the Post Office when I noticed this sign on the 'out' door. I immediately found myself thinking that you'd think it would read 'Our Customers are Priority'. Then I was thinking how, when I send my customers the note indicating the 'whatever' has shipped, I almost always say, 'Shipping is by USPS First Class Mail, which quotes 2-5 days for delivery. Yep, they got that right ... that's how it feels working with the Post Office, 2-5 days to delivery; exact status unknown. So today, I had to go back to the Post Office and I mentioned to the man helping me that I was surprised the sign didn't say 'Our customers are Priority' and he said ..... What Sign.